This is slightly off-topic for this blog but I needed to do it for reasons of my own, and I thought it would be of interest to at least some readers. The above graph shows a rough-but-mostly-right estimate of the ratio of the median price of a single family home to median household income in the San Jose-Sunnyvale-Santa Clara metropolitan statistical area (aka Silicon Valley). 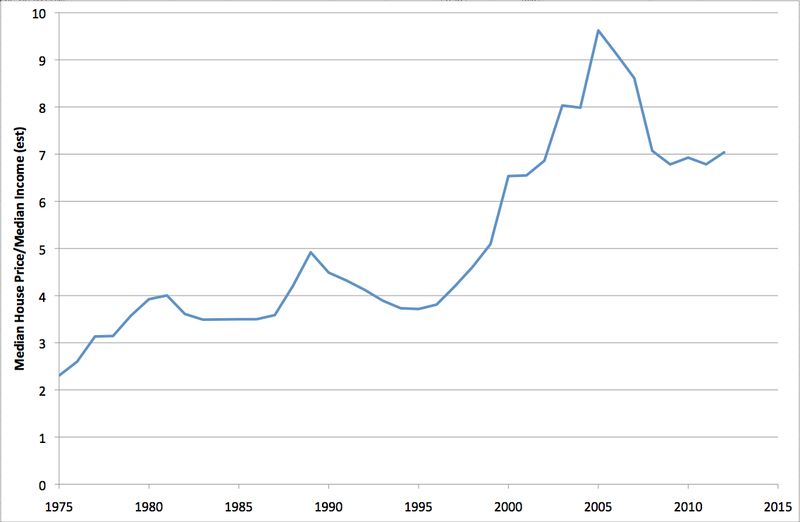 The data run 1975-2012. This was much harder to construct than it should be and I had to make a few approximations. Median house prices by MSA are available for the last few years only at the website of the National Association of Realtors (older data you have to email them and pay for). I extrapolated that backwards using the house price index for the San Jose MSA from the Federal Housing Finance Agency. Then median household income since 2005 is available via the Census Dept FactFinder. Income data for a few older years can be found also from the Census (plus 1999 from here), and the inflation adjustment there can be reversed using BLS CPI data. For years between those, I interpolated the income data using the assumption of constant growth rate. Given the approximate rule of thumb that borrowers with decent credit should be able to buy a house worth about three times their annual gross income, then things were pretty affordable back in the 70s - the median income household could afford the median house. 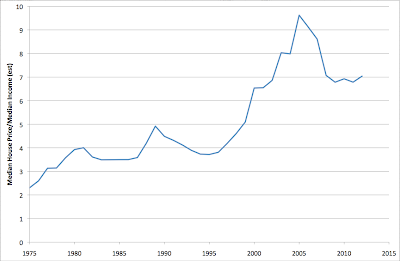 During the eighties and early nineties, the ratio hovered around 4 - rather marginally affordable. Then in the late nineties, it took off into the stratosphere, reaching a peak over 9 in 2005 - indicating only a small minority of buyers could get a conventional mortgage on a median-priced house. Of course, at that time, most buyers were using highly unconventional mortgages. With the collapse of the housing bubble, the ratio declined again, but has now stabilized at a still extremely high value around 7. There's no sign of further downward trend. I think the best way to think of the Bay Area currently is something like a modern day goldrush boomtown. House prices are being supported by people who join a successful tech startup and then are able to cash out with substantial stock options. If you don't strike it rich this way, there's no way to buy a decent house in a decent area on a middle class income. Personal note: I moved to the Bay Area in 2004 and left in 2010 (but still work for a Silicon Valley employer). In the UK, London property prices appear to be locked in what I would call a structural bubble built on foreign inflows. The FT just had an article highlighting the amazing degree of divergence. It is ironic but back in the 1990s we thought that the internet-backed 'death of distance" would iron out differentials; instead it has widened them. Perhaps I'm mistaken, but it seems to me that Silicon Valleys days as the tech hub are numbered. I've run into curious ideas about the chinese over the years, namely that they are intelligent and diligent students (when they aren't cheating), but lack some sort of magical creativity that will always keep Silicon Valley and the American tech industry on top. Personally I don't buy it. China has a whole lot of engineers and scientists, and they are training more. Automated manufacturing may be a gamechanger, but as of now American Industry, or at least the owners of that industry are complicit in moving things offshore by various means. I don't see how Silicon Valley survives as a boutique "design house," in the manner to which they are accustomed. I also think the Chinese are perfectly capable of eating the lunch of a lot of big name companies. We'll see how it plays out. But I'd lay odds things will be very different in the Bay Area 20 years from now. Maybe it is a personal bias on my part. The San Francisco I've always dreamed of was the one of the 60's. Not what it comes across as today. All the cool done got up and gone. Re "death of distance" - I suspect it will be one of those things like how computers would cause a "paperless society". In the beginning, computers caused a lot *more* paper to be used (because now it was easy to print documents and much easier to read them on paper than on the computer screen. As technology improved, it eventually got to the point now where you can see that paper is indeed going away. Similarly, the technology of remote collaboration is not really there - it's better than nothing but it's no substitute for in person interaction (I can report from a good deal of personal experience!). Eventually it will get good enough, I suspect, and then we will see the collapse of distance. sunbeam: I suspect you underestimate Silicon Valley's cultural advantages. There are lots of smart scientists and engineers all over the US and Europe too, but nowhere seriously competes with SV at what it does, because nowhere else has the critical mass of all the right expertises in one place. I won't bore you with population statistics (though strangely I think you would like it). China is so big, that it is unavoidable that they wind up with one, probably more areas with the right expertise, as you put it in one place. And that is without trying, though I think they are trying to do just that, become the tech leader. Personally I don't believe that China wants to have some sort of military empire, a la the US and it's half baked one. I do think they want to be rich. I'd wager they are trying to duplicate Silicon Valley or at least it's success, and have been trying for a while. I think they will eventually succeed. And while they don't come across like Japan and MITI, I do believe they target things and make events happen behind the scenes to some extent. I forget the name, but I read an article in the past year about a Chinese company manufacturing CPU chips for servers, and the article questioned how smart it was "because they wouldn't make money, competing with Intel." I don't think the writer understood the point. I think the Chinese will continue this even if it doesn't right now. Making a profit is for 10 years down the road or so. And if you bring up trade agreements and dumping, well tee hee. Get ready for the big wall of obfuscation. In the end the only tool the US would have is trade sanctions and little in recent history shows they have the leverage or interest in making them stick.